Part of the Game or Cheating? Last night’s World Series game once again exemplified the many contradictions of professional sports. Two facts are clear from last night’s game. First, the umpires overturned an incorrect call on the field at second base. 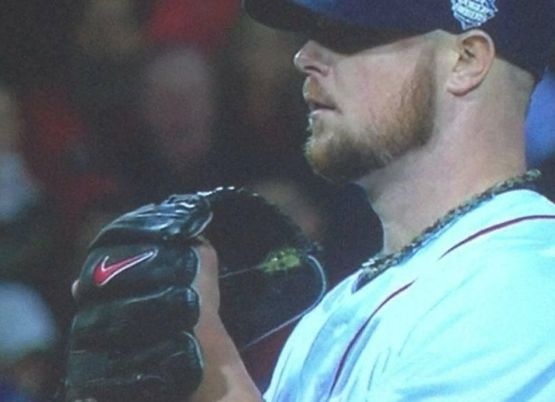 Secondly, Jon Lester had some sort of substance on his glove and used that while pitching. In the span of just one night one of these things was deemed a great job because it “got the call correct” while the other was said to be “just a part of the game”. Why? What is the difference? The call at second base involving Pete Kozma was incorrectly ruled an out initially by the umpire that was 10 feet away with an unobstructed view. It was an incorrect call but he made it. Not until the other five umpires gathered did they overturn the call. This is unusual because rarely do umpires overturn a call when the initial umpire has such a clear view. Unless it is obstructed they have typically sided with the initial call. But as MLB has learned from the previous years about allowing incorrect rulings they are moving towards the idea of simply getting the call correct. Which they did last night. The second part of the equation last night involves the substance on Jon Lester’s glove. I have heard numerous ballplayers, ex and current, media members and baseball officials claim well it is no big deal. There are varying factors into why they would say this; is it because their own teammates are using something, is it because hitters prefer the pitcher have a better grip or is it because it simply is part of the culture. This is the bigger issue last night. Why is it accepted as okay for a pitcher to do something that is specifically forbidden in the baseball rulebook? To me this whole situation is eerily similar to the steroids controversy. Players saying oh well it is okay if the pitcher is using that because our guys are too. Umm….isn’t that how we got caught up in the juicing era? Why are these players so nonchalant about this issue? I have heard some fans and media members say well the players don’t mind why should we? Again, just look at the steroids. Did the players mind steroid use until they got caught and society started to backlash against them? No. They were happily using, putting up record breaking numbers and getting record breaking contracts. The issue in regards to hitters preferring pitchers have a better grip. I’m sorry, I am sure players also preferred when they were exhausted in the mornings and were able to pop uppers or when they could shoot up with various steroids to get a better workout in. Just as steroids are performance enhancing so is having an illegal substance on your throwing hand. We can not let the players simply control the game because they have no opinion on something that is ILLEGAL. It is up to the league’s officials to improve the game and certainly allowing a blatantly illegal act is not in the best interest. Baseball, and all of sports, is no longer just a group of guys getting together and playing a game to see who is the best. It has evolved into entertainment and with that the sports leagues have the responsibility to put the best image of their game on the field. Their goal is promote that image to the public in order to generate higher revenues. Is the best image of the league really one where it is blatantly obvious someone is doing something illegal? The response by MLB today in regards to the situation was a joke. “No complaints from the Cardinals so we aren’t going to take any action.” That is why the culture needs a change. Football is changing their culture. Focusing more on safety. Why can’t baseball change their culture and focus more on integrity? Baseball got one mistake right last night with the call at second base; why do they refuse to correctly get the other mistake correct? This entry was posted in Uncategorized and tagged Baseball, Boston Red Sox, Cheating, Football, MLB, NFL, Playoffs, Sports, St. Louis Cardinals. Bookmark the permalink.